This medium sized diving duck is one of the few ducks with a circumpolar distribution and is found across Eurasia as well as North America. It is more associated with salt water than the more abundant Lesser Scaup. The breeding range in North America is primarily in coastal tundra in western Alaska and around Hudson Bay. The majority of the population spends the winter along the Atlantic and Pacific coasts, but it is also found on large unfrozen lakes from the Great Lakes south. In Tennessee, the Greater Scaup is an uncommon migrant and winter resident in the western part of the state and rare elsewhere. 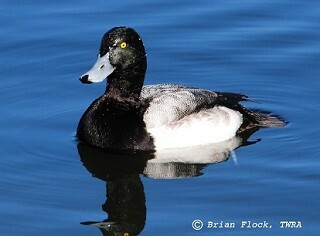 Description: The Greater Scaup has a rounded head. The male’s head looks dark but has a greenish iridescence in good light. The neck, chest and hind-end are black, the back is gray, and the sides are white. The female is overall brown, with a white band at the base of the bill. In flight, white extends more than halfway out on the wing. Voice: Female gives a rough, raspy karr-karr-karr. The male is often silent. Lesser Scaup are more common in Tennessee. 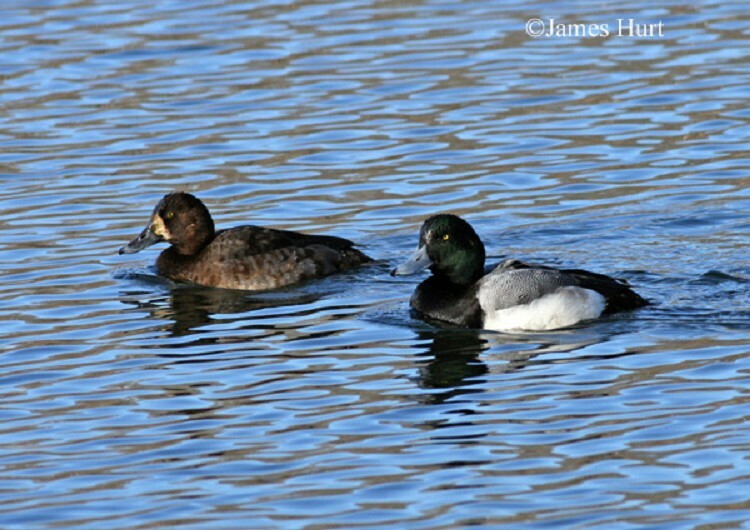 These two species look very similar, but Lesser Scaup have a more angular head, male’s head has a purplish gloss, not greenish, and less white shows in the wing in flight. Male Ring-necked Ducks have a black back, a more pronounced bump on the back of the head, and a white ring on the bill. The female has an eye-ring and lacks white band around the base of the bill. Habitat: In Tennessee, found on rivers and lakes. Diet: Mollusks, crustaceans, aquatic insects, seeds, and aquatic plants. Status in Tennessee: The Greater Scaup is an uncommon migrant and winter resident in East Tennessee and rare in the rest of the state. They arrive by late November and depart by mid-April. Greater and Lesser Scaup look so similar at a distance that it is very difficult for waterfowl managers to get an accurate population estimate. This information is critical for the development of management policies and for setting harvest limits for each species. Unfortunately, because of these identification difficulties, the 2 species are combined during aerial (and most ground) population surveys, so changes in populations cannot be detected. The oldest known Greater Scaup in the wild was 18 years, 6 months old. Best places to see in Tennessee: Chickamauga Lake at Booker T. Washington State Park. Not easily detected elsewhere in the state.